Last evening reminded me of how deep the connections between Iceland and the U.S. can be. I welcomed Ragnheidur Lilja Lennon Þorðardóttir and her family to our residence. Ragnheidur Lilja, who goes by Lee in the U.S., is celebrating her 90th birthday with her extended family of Icelanders and Americans. Her very rich life not only bore witness to an important period in Icelandic American relations but it shows how our two countries have grown closer together. As a young Icelander, she met and married a dashing Air Force pilot in the early 1940s. 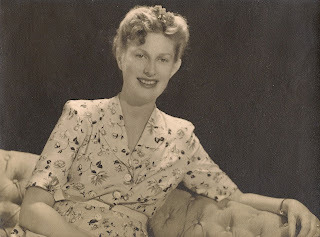 Their first child was born in Iceland and she then followed her husband to Germany, Japan, and many other places in the world until she settled back in Iceland as a widow and eventually moved to the United States. Her children are as much Icelanders as they are Americans; they visit Iceland frequently to spend time with relatives. One of them joined the U.S. Foreign Service. As we shared a few moments together, it occurred to me that the question of nationalities never came up. The fact that this family had both American and Icelandic citizens in their midst is seen as a perfectly normal state of affairs. It is reassuring to know that stories like this are very common. I met with the President and two board members of the Icelandic American Society and learned about some of the great work they have been doing for several decades. The Society, which is dedicated to promoting Icelandic and American culture, is perhaps the oldest of its kind in Iceland. They are also responsible for administering the Thor Thors Memorial Fund which awards grants to Icelandic students conducting research or graduate level studies in the United States. I am very excited about the potential for close cooperation between the Embassy and the Society as we are both working towards the same objective: strong relations between the peoples of Iceland and the United States. Two days in the beautiful Westman Islands provided a brief snapshot of this amazing place. I had the honor of meeting Óskar Jakob Sigurðsson, a living legend in Iceland and beyond. He takes care of Iceland's last manned lighthouse, collects scientific air and rain samples, and holds the world record for the largest number of birds tagged for conservation purposes. Universities and institutions from all over the world benefit from his service, including NOAA and the University of Miami. I also saw the vestiges of the 1973 eruption, when the island's inhabitants showed the world what ingenuity and perseverance can accomplish when they slowed down and eventually stopped the lava that threatened to engulf their city. I was proud to learn that the U.S. Navy provided many of the pumps used to pull water from the sea to cool the lava. It was also impressive to learn how the islands’ economy is thriving with very strong fisheries and tourism industries. I can’t wait to return and hike some of the nearby cliffs. In April and May of this year, the central and southern regions of the United States were hit by a series of devastating tornadoes that left a trail of unimaginable death and devastation. The areas affected included Missouri, Alabama, Mississippi, and Georgia. We were pleased to learn that Icelandic Glacial donated 43 tons of water in support of relief efforts in several of these areas. To facilitate the delivery of the water, we understand that Icelandic Glacial partnered with Anheuser-Busch. We are grateful for this donation and for Icelandic Glacial’s commitment to support the victims of natural disasters. It was a pleasure to welcome Fran Ulmer, Chair of the U.S. Arctic Research Commission, and the majority of the Commission's members to Iceland. The Commission develops goals and objectives for the U.S. Arctic Research Program. Commissioners participated in the “The 7th International Congress of Arctic Social Sciences“ in Akureyri and traveled to Reykjavik to meet with officials from some of Iceland’s foremost research institutions (Marine Research Institute, the Icelandic Meteorological Office, The National Energy Authority, and RANNÍS). They also were received by President Grímsson. The visit is a concrete result of the May 17 Washington meeting between Secretary Clinton and Foreign Minister Skarphéðinsson where they discussed strengthening cooperation on Arctic research. On the occasion of the visit of the USCG Barque Eagle, I had the opportunity to fly in an Icelandic Coast Guard Helicopter to meet up with the Eagle and participate in a wreath laying ceremony 30 km west of Borgarnes in Faxaflói at the site where the USCG Alexander Hamilton sank on 29 January 1942 as a result of war hostilities. The Alexander Hamilton, which was protecting merchant convoys crossing the Atlantic, was the first USCG vessel sunk in WW II. Twenty-six sailors were killed instantly; six died later of their injuries; ten more injured men required hospitalization. 81 sailors were rescued by Icelandic fishing trawlers. The lighthouse Garðskagaviti in Gardur, which is the tallest in Iceland, was built in 1944 as a gift from US Coast Guardsmen in gratitude for their rescue by Icelandic sailors. 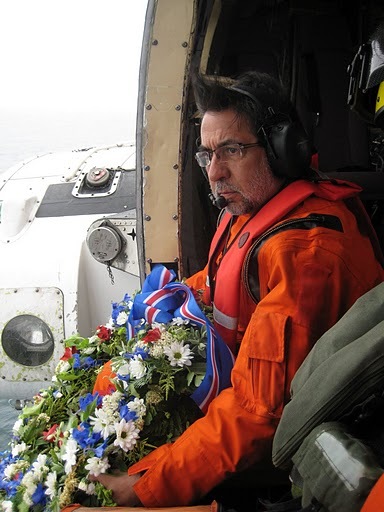 The wreath laying ceremony, which honored the sacrifices made by American and Icelandic sailors during war, was an opportunity to reflect on the ties of friendship between the United States and Iceland.